A Golf View Resort Adjoining Marriot Hotel at Newport City. Emerge from Everyday Life Renewed. In an Unrivaled Resort Community in the City. Rekindle your romance with everyday. And immerse yourself in the heady pleasures of a privileged resort setting. 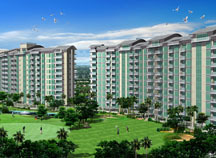 The Parkside Villas at Newport City. Rising above the golf course, this grand seven-cluster community breathes new life into all your experiences. Surrounding you in a charmed ambiance of exquisite sights. Lush open spaces. And luxurious attractions that move you, body and soul. Every beautiful place in the world has its own music. At The Parkside Villas, nature's relaxing rhythms drown out the dissonance of the city. And the siren song of earth, sky, water and wind is at its sweetest. Here, touch base with your inner self. Deepen your connection with all living things. And discover that tranquility can be found not only outside, but also within.